George Clooney will return to "E.R." Would you be surprised to learn that ER gets better ratings than 30 Rock? It's true! While there's no sense pretending that the show is even the least bit zeitgeisty anymore (nor has it been for close to a decade), people still keep tuning in on Thursday nights at 10pm, just like they've been doing every Thursday night since the show's debut in 1994. But now that the longest running primetime medical drama of all-time has entered its fifteenth and final season, some of its alums have agreed to come back to Chicago's County General Hospital to bid the emergency room a final farewell. And while we enjoy a slice of nostalgia pie just as much as the next guy, we're not sure we'd go out of our way to watch an episode in which Sherry Stringfield or Eriq La Salle reprise their roles. 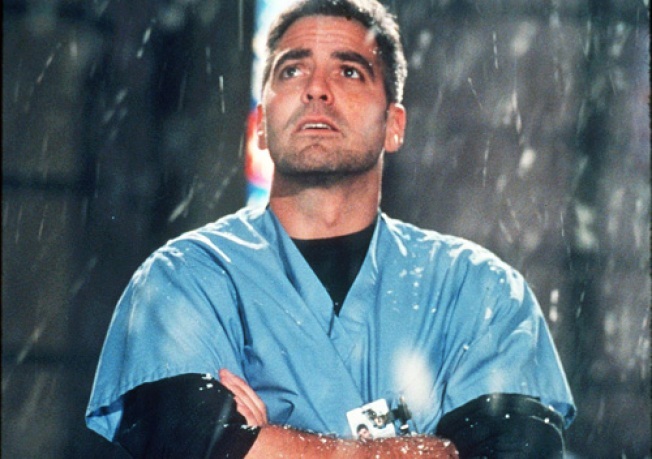 However, what if George Clooney were to return as Dr. Doug Ross, the part that made him a star? Now that would be a moment worth DVRing. Clooney will be shooting some scenes on the downlow for the show today and tomorrow. This, despite previous assurances from Clooney's camp and ER executive producer John Wells that the two time Sexiest Man Alive didn't have any room in his schedule to mozy his way onto the set this year. It is not yet known in what episode or even in how long Clooney will be returning for, but our guess that it will he'll pop up alongside Nurse Hathaway in the series finale. However, we're most curious to see whether or not Clooney will resurrect the head bobbing style he pioneered during his five-season run on E.R., the acting tic (or was it force of habit?) that David O. Russell worked so hard on the set of Three Kings to break him of. For authenticity's sake (not to mention our everlasting devotion), please George, make it happen! Get Ready for the Lowest-Rated Oscars Ever! Don Draper Was Almost Jack Donaghy!